Shinmen Musashi no Kami Fujiwara no Genshin (Miyamoto Musashi) (1584-1646)(childhood name-Ben no Suke) was born in Miyamoto village near Osaka in Mimasaka province. His father was Shinmen Munisai of Miyamoto and his mother was Omasa from Harima province, daughter of Hirada Shokan of the Harima clan who was a retainer of Shinmen Iga no Kami Sudeshige, Lord of Takeyama castle. 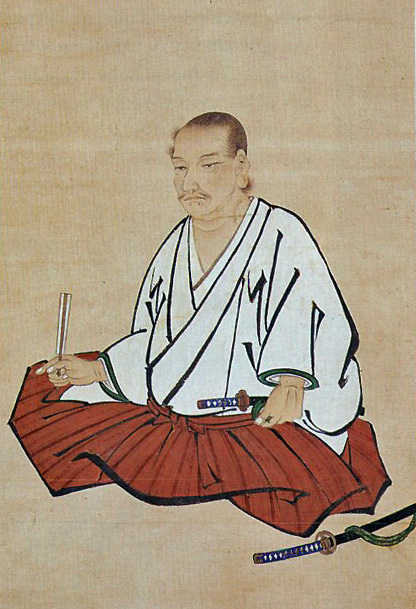 Shogun Ashikaga Yoshiteru (reigning from 1546 - 1565) once started a comparison fight between the Yoshioka and Shinmen Munisai. Shinmen Munisai won 2 of 3 matches. This battle caused a crucial feud between both families. Just one generation later, wins against Yoshioka Seijuro and Yoshioka Denshichiro by Miyamoto Musashi, and his assassination of Yoshioka Matashichiro ended the feud and led to the decline of the Yoshioka in 1604. Musashi studied sword and jutte with his father who was particularly proficient with the jutte until the age of about seven due to his fathers disappearance (death?) whereupon he was placed in the care of an uncle from his mother's family. His uncle was a priest and his martial training and education continued with him. There are conflicting records but it is generally believed that he was a large man, over 6' tall and prone to fight with little provocation at even an young age. After 'perhaps' fighting at the age of 15 or 16 years of age with the forces of Ishida Mitsunari against the Tokugawa at the Battle of Sekigahara in 1600, and surviving the loss, Musashi again went on Musha Shugyo 武者修業 (pilgrimage to train) in 1605. It is rumoured that Musashi was at the Siege of Osaka, but, I can find no evidence to support this. Musashi was at this time ronin (masterless and without official income) and needed sponsorship by a lord. This is a time worn story from this point on with many variations including his famous duel with Sasaki Kojiro. Musashi's life has become semi-mythological in nature. Musashi had many duels and was an artisan of reknown, both carving, metalworking and ink drawing (ukioye). In the twilight years of his life (in fact the last weeks of his life) he authored a manual addressed to his pupil Teruo Nobuyuki based on his swordsmanship (Go Rin No Sho) that many use to this day as an insight to success in many endeavours. Given the discipline he developed and the understanding he derived from his study of swordsmanship one can only hope to emulate Musashi on their own Musha Shugyo. These are the battle flags under which Musashi may have fought at the Battle of Sekigahara.